Inspiring Ideas with artist Jeanne Winters: Christmas Decor and Prize Winners!! Christmas Decor and Prize Winners!! Wondering how to keep the Christ in Christmas? 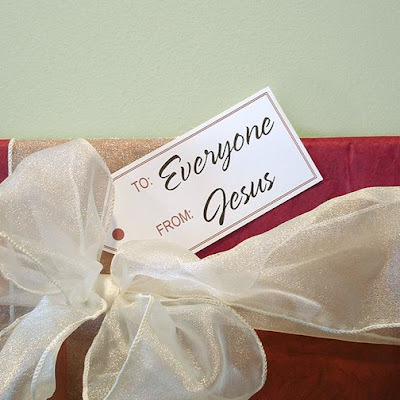 ... here's an idea that allows you to share some of the wonderful gifts Jesus gave US! Adorn your mantel, bookshelf or foyer table with stylish presents. Each package highlights one of the MANY blessings from Jesus. My display was for my mantle, but you can scale this down to go just about anywhere! Sprinkle these gifts among your china display or create a gift tower centerpiece. I suggest 3 or 5 boxes for a montage as odd numbers look best and be sure to have one larger box to create a focal point. Other word choices are: Love, Wisdom, and Faith. Have fun with it and don't forget to send me your photos! A BIG THANK YOU to everyone who commented and blogged and stormed your Hallmark and posted my buttons and emailed your OB and told your peeps!!!!!!!!!! I truly appreciate every one of you!!! PS: if you're new here ... please check out my new gift line: Simply Inspiring at Hallmark! Merci beaucoup!! Such a beautiful way of displaying the wondrous gifts of our Savior! Congratulations to the lucky winners! That is beautiful! Congrats to the winners! Ooh, I love this idea! Beautiful! Thanks Jeanne!!! Your stuff is beautiful! I want more! I'd love to win one of your creations, you know! hahaha! I can make them but I'm sure you make them better than I do. hahaha! Anyway, I might just make this Christmas Decor. It's very encouraging for people who will see them and they might just get it from me. hahaha! You are all blessed, my dear friends! Knowing that GOD is our Gift for Christmas, is all worth it! I'm so bummed! I just found your blog today and missed the giveaway! Oh well. I am going shopping Thursday so will be on the lookout for your line. I really liked several things. I love the package idea. I opened a small gift shop in May, and just put out 11 Victorian stockings I made. Think I'll make some 'mini' packages to either put in the stockings, or display next to them. Those look great on your mantle! 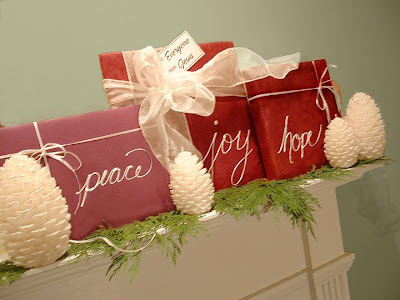 Presents are a great way to decorate inexpensively, and we love how you tied in the true meaning of Christmas! I just stumbled upon your blog and I'm so excited! I just love your ideas and especially the way you're using the gifts the Lord has given you for His glory! Awesome! I'm going to put a link on my blog and visit regularly! Thanks! I received the wonderful items you sent me from your giveaway...! They are truly gorgeous, and look so nice in my sitting room. Thank you so much for your generosity! I saw your display in person at the Hallmark in our mall. It looked fabulous! So fresh and pretty. The associate (an older woman) said it was being well received. They are owned by Hallmark corporation and these displays are in those she said and being ordered by the privately owned shops. I absolutely love this idea along with your others. I am definitely going to do this one, along with the little goodie sacks and Jesus ribbon. Thank you so much for sharing. I love it!! You have amazing ideas and inexpensive to make. THe box idea is a great way to give praises to our Lord and Savior. Thanks for sharing. Gorgeous packages. I love all of your festive and thoughtful ideas!